Officers with three days’ training can be issued with a Taser. A major increase in the number of police officers equipped with electronic stun guns has prompted fears in the force that it is at risk of “mission creep”, with the powerful weapons deployed for trivial reasons. An inquiry by the London assembly, the first of its kind, has heard evidence that the Metropolitan police plans to increase the number of officers issued with Tasers by more than 50%, up from 800 to almost 1,300. The plan would see 40 officers per borough equipped with the devices. The move would bring the Met into line with other forces that have significantly increased the number of officers issued with Tasers. The rise in the weapons’ ubiquity has been matched by a corresponding increase in their deployment. Freedom of information requests reveal that the weapons were discharged 1,371 times in the year ending March 2011, a 66% rise on the previous year. Tasers, pistol-shaped devices that use nitrogen to fire sharp darts connected to wires carrying 50,000 volts of electricity, were originally authorised only for officers who had undergone firearms training. But this has been quietly expanded so that officers who have passed a three-day training course can use the devices. The move has led to concerns that the weapons are being used disproportionately and inappropriately. Last March, a 59-year-old man suffering from Alzheimer’s was Tasered in Lincolnshire. The following August, a Worcester man with mental health issues was Tasered before falling from a porch roof. Deputy chief constable Simon Chesterman, the Association of Chief Police Officers’ national lead on arming police, told the assembly that he would “be very concerned if it becomes a compliance tool”. He said international studies showed the weapons had been used to force someone out of a car or to consent to have fingerprints taken. However, he stressed the UK’s Taser training was the “best in the world” and designed to ensure the weapons’ use was proportionate. 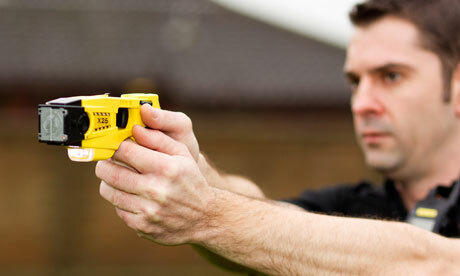 Statistics show only around a quarter of all Tasers drawn by police are actually fired. But Amnesty International said it was extremely concerned that the wider rollout of the stun guns was fundamentally changing UK policing. It warned the devices were open to abuse because they were portable, simple to deploy and could inflict “severe pain at the push of a button, often without leaving marks”. Amnesty also said there were concerns Tasers could cause serious or long-term health damage. It said more than 500 deaths in the US could be attributed to the deployment of Tasers. And a paper published last year in the Journal of the American Heart Association claimed there was a direct causal link between Taser deployment and heart failure. The London assembly inquiry has been presented with evidence suggesting a disproportionate number of Taser incidents involve people with mental health issues and people from ethnic minorities. Met figures show that half of all people Tasered last year were black. Between 2008 and 2011, the proportion of people Tasered who had emotional and mental health problems increased from 20% to 30%. There is growing concern about the number of younger people being Tasered as a result of police targeting gangs. Between 2008-09 and 2010-11, 61% of Taser deployments were on people aged under 30. The Metropolitan police authority, the former watchdog charged with overseeing the London force, had restricted any expansion in the Met’s use of tasers. But the mayor’s office is enthusiastic about their rollout, as is the Met’s police federation which believes the devices can help protect officers.